Also available at Tackle Warehouse. Modern fishing lines have come a long way in recent years, but anglers are still having the same problems with twists, coils and degrading manageability with aging lines. In this video, we show anglers the true benefits to using a line conditioner spray and we offer a few tips that will maximize their effectiveness and your success with all types of fishing line. Get that edge with a line conditioner. One thing I know is that bass fishermen are always looking for an edge, be it with spinnerbaits, jigs and one in particular that I can think of, is deep diving crankbaits. They're always adding weight to the treble hooks, they're drilling holes in the bait, they're using dremels to sand the bill down sharper to get the lure to dive deeper. They go to all these extents, but the one thing they don't realize, is that it can be as simple as using a line conditioner to make them cast a little bit futher (10 feet or more) and get that bait to run a little bit deeper. 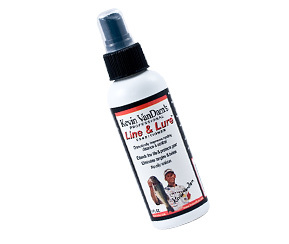 There's a lot of different products on the market, and there are a few brands that make stuff like this but one in particular that I use and recommend is Kevin VanDam's Line and Lure Conditioner. It does a real good job at making your line more manageable, cast further, and prevent coils with aging line. One tip I recommend is always spraying your line at least a couple hours before making your first cast. You will notice a big improvement in a line conditioner's performance by letting it soak into the line for bit before fishing. If you can spray your line the night before you go fishing, even better.